Connected by an insulated copper wire, it won't overheat even after long hours of use. The LED lights have an IP65 weatherproof rating which means it can survive humidity and light water splashing. ON/OFF: Press this button to turn on or off. 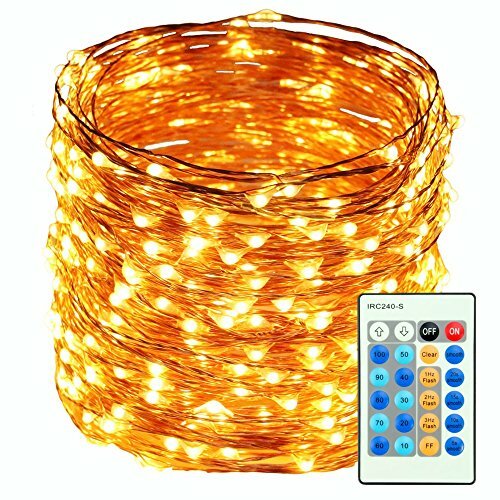 ULTRA BRIGHT: This Warm White starry string lights have 200 super bright LED lights on 66 feet (20 meters) long ultra flexible copper wire with 4 inches distance between each LED bulbs. SMART REMOTE: Updated Remote Controller with short-circuit protection,Control the rope lights remotely with 10 brightness levels and 3 different modes - Smooth / flash / Strobe. UL CERTIFIED: High-safety power adapter is guaranteed with UL certification .And String lights are enameled copper wire and low current ensures that the copper wire is insulated and won't be overheat. You can fully enjoy the lights without worrying about being hurt. WARRANTY: We support Led String Lights12 months warranty. If you have any problem with this item, please contact us directly, and we'll provide help for you. The lights Great for Indoor or outdoor ornament light, garden,stairways, corridors, yards, bedroom, wedding, party and holidays. If you have any questions about this product by HaMi, contact us by completing and submitting the form below. If you are looking for a specif part number, please include it with your message.